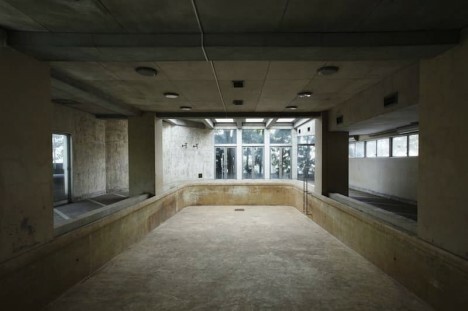 Until recently, this indoor swimming pool on the vacant ground floor of a 1970s apartment building in Tokyo was just an empty space, dry and disused for years. 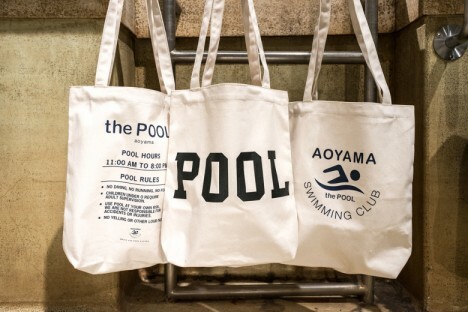 Now it’s a pop-up shop by Nobuo Araki known as ‘The Pool Aoyama‘ hawking clothing, accessories and swim-themed promotional items. 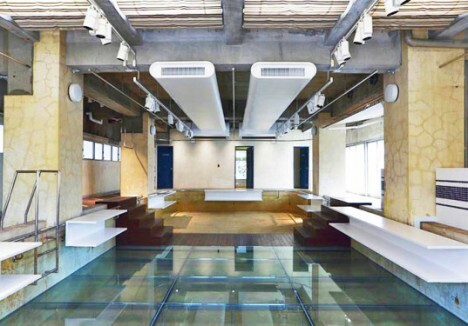 The designers left the pool almost entirely intact, installing a glass floor that mimics the look of water. 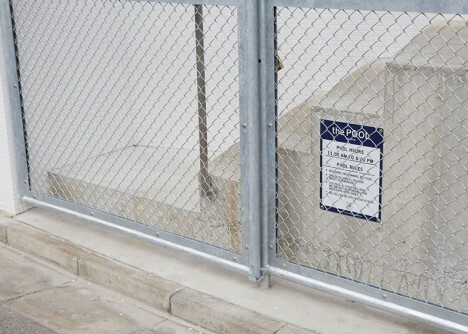 The shell of the abandoned pool and its steel ladder have become key elements of the final design, with the pool walls defining the space of the shop. 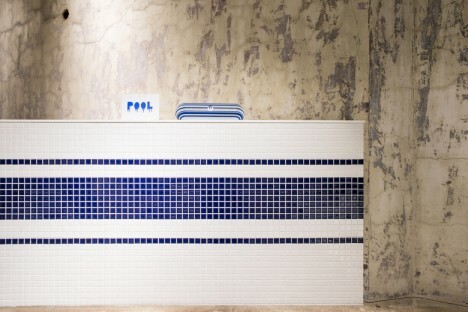 Wooden stairs on either side of the pool meet to create a sort of bridge across the glass. 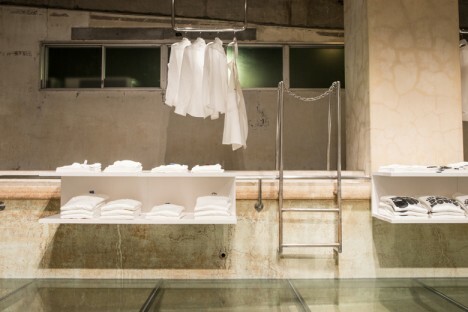 White shelving units are mounted along the edges to display goods, and U-shaped stainless steel clothing racks hanging from the ceiling echo the look of pool hand rails. 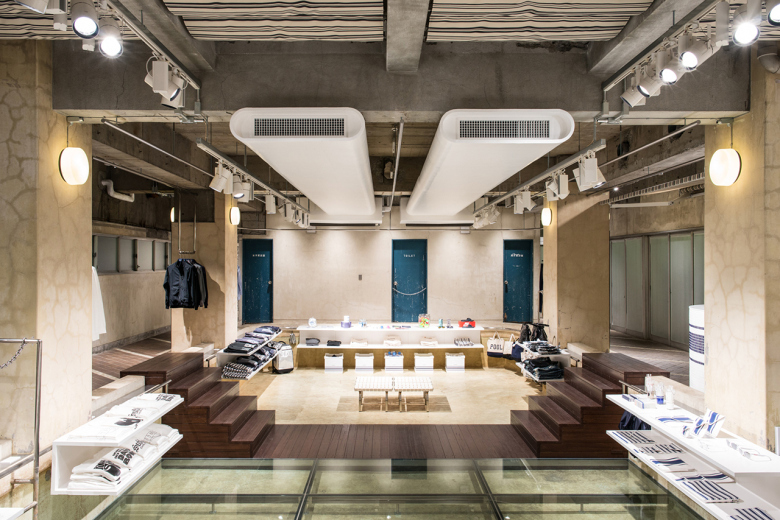 The designers were drawn to the soft light, charm and quirkiness of the space, and the shallow depth of the pool lends itself well for adaptation into a showroom. 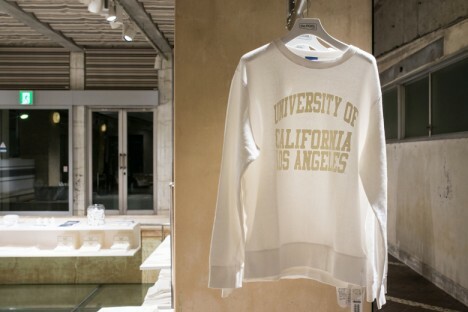 A newly installed glass ceiling floods the room with natural light, and the bathrooms were turned into fitting rooms.